I have decided to add an About Page to the sidebar Just finished up this pic. The page will be up in a moment. 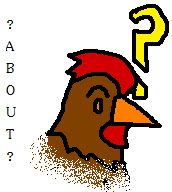 This should alleviate some of my "But why a chicken blog?" comments and possibly turn them into "Oh dang. Best site ever" comments. I mean the second probably not, but the first yeah. Anyways it's basically a remake of the about post I did a while back. Even used the same pic. Also 3 posts in a day... I think I'm back baby! Oh dang! Best site ever! Hell yeah, even threw in a couple of free exclamation marks. You're welcome. Oh yeah? Well guess what. *Writing backwards (and upside down) is the only way to express true adoration. As in, I'm so in love with this, it's blown my mind and I can only write backwards. I mean sdrawkcab.